Giant Foam Castle Facade Prop - Dino Rentos Studios, INC. 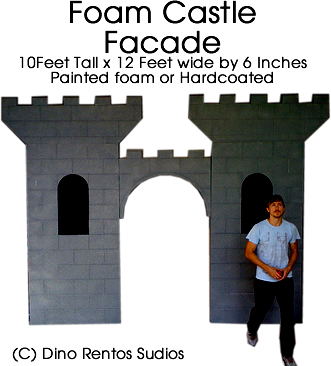 This 10' tall by 12' wide by 6" thick castle facade prop is ready to use. Assemble in a few minutes. Perfect for your display or event decoration. Add optional Hardcoating for a more durable display. Ideal for long-term use.